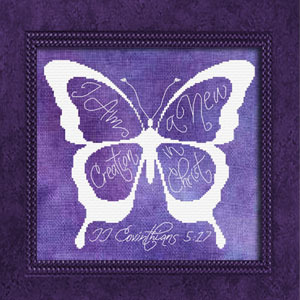 New Name Blessings designs featuring Names, Name Meanings, and matching Bible verses along with attractive borders are added monthly. Every few months Custom Designs are added to our Custom For You Galleries. Take a look at page four were most of the latest designs may be found. Finished size is 10 x 10 inches based on 14 Count aida or 28 count linen or evenweave over two strands - 140 x 140 stitches - 25.4 x 25.4cm. New - Laser Engraved Adder Wood Needle Minders! Since their introduction the Inspirational Needle Minders have been a huge success. I fell in love with these adorable needle minders made by Joseph's Workshop. 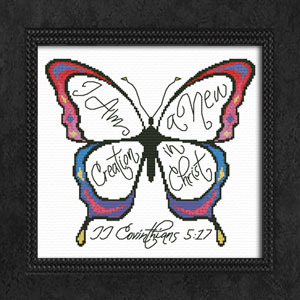 Collect a few for yourself and/or share with another stitching friend, or give as refrigerator magnet gifts. 7 Designs available - $7.00 each and Free Shipping Everywhere! 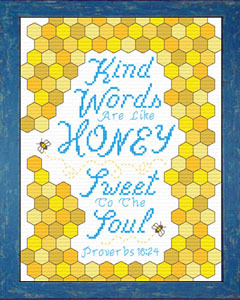 Click to View Larger Proverbs 16:24 lends itself perfectly to a Bee and Honeycomb theme and was so much fun to design! You may enjoy stitching this design and finishing it as a pillow front or have it framed. Either way, make one for yourself and give another to a dear friend whose "kind words are like honey". "Sweet to the Soul" finishes to a standard frame size of 8 x 10" based on 14 count Aida or 28 count Even Weave or Linen (over 2) 20.3 x 25.4cm - 140 x 112 stitches. No Custom Framing Needed! Available as a PDF instant download chart or as a complete kit. 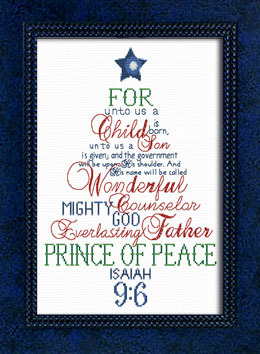 For unto us a Child is born, unto us a Son is given; and the government will be upon His shoulder. And His name will be called Wonderful Counselor, Mighty God, Everlasting Father, Prince of Peace. Most of the design is created in straight or back stitches for a quick and easy finish with attractive results. 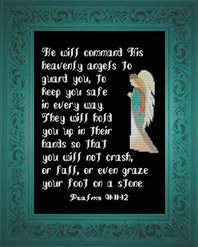 Click to View Larger This design came about due to a customer suggestion to use the angel design found in the 5 x 7 inch gallery called "His Name" along with the Bible verses found in Psalms 91:11-12. "His Heavenly Angels" finishes to a standard frame size of 8 x 10" based on 14 count Aida or 28 count Even Weave or Linen (over 2) 20.3 x 25.4cm - 140 x 112 stitches. No Custom Framing Needed! 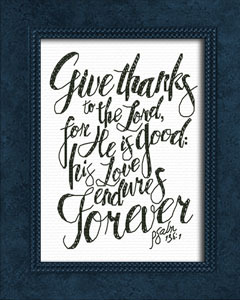 The exuberant lettering style certainly fits this Bible verse of thanks to our Lord! This design finishes up quickly as you will place all your cross stitches and go back and outline the lettering with simple straight stitches. The straight stitches are charted in a contrasting color for easy placement. Stitch with any color fabric along with your favorite contrasting floss color. 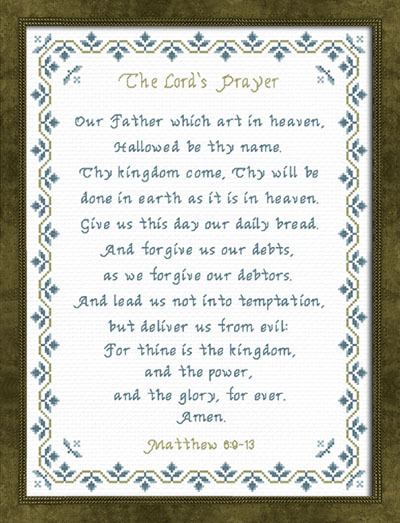 This design came about as a customer request by Tamara Suttle who asked for The Lord's Prayer in the King James Version with the same Trellis Border as the New Living Translation design. Stitch on white fabric for a contemporary look or on vintage for a sampler appearance. Finished size 12 x 16 inches based on 14 Count aida or 28 count linen or evenweave (over two strands) 169 x 221 stitches - 30.6 x 40.1cm. This design is charted in 3 color ways - Antique Blue, Rose and Pink/Purple in both DMC or Anchor but may be stitched in any three complimentary shades. Sandra - I LOVE both your new designs and will order immediately! When my goddaughter was baptized, I had favors of cookie cutters with that verse on the recipe card I attached to each cookie cutter. Now she is 7 years old and LOVES butterflies. The other design I will do for my mom, who is into lighthouses. receive the complimentary chart - "His Name Is Jesus"